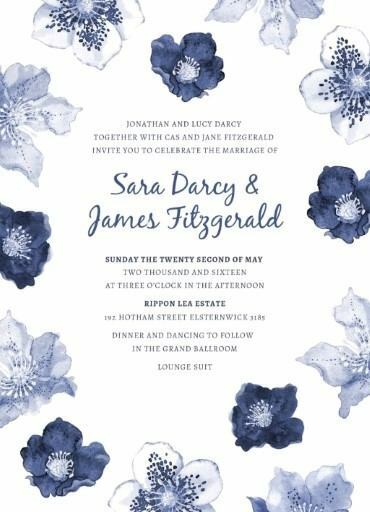 This engagement invitation card is from the rustic wedding invitation set, 'Blue Floral'. 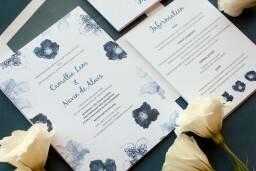 This set features a soft blue floral design that is perfect for any outdoor or country-side wedding. The use of watercolours and simple text makes these invitations effortlessly romantic. An engagement range is also available in this design. This design is available in digital print. I don't think words can describe the beauty of this engagement invitation. The border of flowers are so beautiful that one is almost lost in what has to be love. Plus the coloring and tone of the information is just outstanding.